Ever wonder how cured meats like salami and ham are able to retain their seemingly fresh pink color after weeks on the store shelf? They may be treated with nitrates or nitrites – chemicals commonly used as coloring agents, preservatives and flavoring. Although they can prolong a food’s shelf life and give it an attractive hue, they come with health concerns. Nitrites and nitrates are used as preservatives in cured meats such as bacon, salami, sausages and hot dogs. Nitrites, which can form from nitrates, react with naturally occurring components of protein called amines. This reaction can form nitrosamines, which are known cancer-causing compounds. 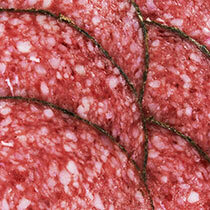 Nitrosamines can form in nitrite or nitrate-treated meat or in the digestive tract. Studies have linked nitrites to stomach cancer (IARC 2010). Some data also suggest an association with cancer of the esophagus; one study showed an increased risk in people who eat cured meats more often (Rogers 1995; Mayne 2001). There is also evidence that nitrites may be associated with brain and thyroid cancers, but a causal link has not been established (Preston-Martin 1996; Pogoda 2001; Aschebrook-Kilfoy 2013; IARC 2010). In 2010, scientists at the World Health Organization’s International Agency for Research on Cancer declared that ingested nitrites and nitrates are probable human carcinogens. The California Office of Environmental Health Hazard Assessment is currently considering listing nitrite in combination with amines or amides as a known carcinogen. Some nutritious foods such as spinach and other leafy vegetables are naturally high in nitrates, but human studies on nitrate intake from vegetables have found either no association with stomach cancer or a decreased risk (IARC 2010). Look for added nitrites and nitrates on food labels and avoid them. This will not only reduce your exposure to additives associated with cancer but will also lower your intake of cured meats that can be high in unhealthy fat and cholesterol. Use EWG’s Food Scores to find foods without nitrates and nitrites. Potassium bromate is used to strengthen bread and cracker dough and help it rise during baking. It is listed as a known carcinogen by the state of California, and the international cancer agency classifies it as a possible human carcinogen (IARC 1999; OEHHA 2014). It causes tumors at multiple sites in animals, is toxic to the kidneys and can cause DNA damage (IARC 1999). 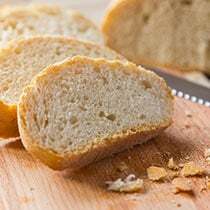 Baking converts most potassium bromate to non-carcinogenic potassium bromide, but research in the United Kingdom has shown that bromate residues are still detectable in finished bread in small but significant amounts (Ministry of Agriculture, Fisheries and Food 1993). Both the United Kingdom and Canada prohibit the use of potassium bromate in food, and it is not allowed in the European Union either. The United States, however, still allows it to be added to flour. Potassium bromate is an unnecessary additive, so read labels and avoid products that contain it. Use EWG’s Food Scores to find foods without potassium bromate.